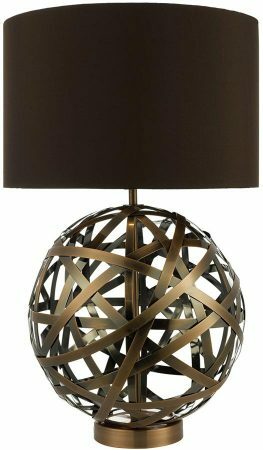 The Dar Voyage modern antique copper finish ball table lamp with dark brown shade features a central globe made from interwoven metal bands. Circular plinth base with antique copper bands forming a globe, with antique copper finish stem topped with a 15″ rich faux silk brown lined shade and fitted with an inline rocker switch on black cable. A large ball formed from artfully woven antique copper bands with rich faux silk brown shade lined in brown to give a beautiful light spill. A class 2 double insulated table lamp, no earth required. There is a matching pendant in the Voyage lighting range that can be viewed below. Why not go for a different look with a desk lamp for your bedside? We’ve a large selection of lamps suitable for your bedside so jump in and see which lamp suits your bedroom best.